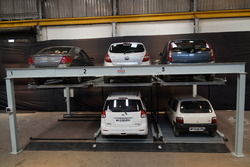 Prominent & Leading Manufacturer from Nashik, we offer two leg hydraulic car stack parking system(independent), automatic car puzzle parking system, mechanical car parking system(independent), four leg car stack parking system(independent), two level stacked parking systems(independent) and g3, 6 module puzzle parking system. We are the manufacturer and supplier of Two Leg Hydraulic Car Parking System. With the help of our skilled professionals, we are able to provide our clients a superior range of Automatic Car Parking System. 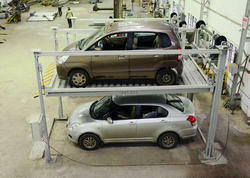 This Automatic Car Parking System is vastly used in heavy traffic areas to prevent over car parking. Further, we offer these products in different models to meet the specified requirement of clients at reasonable prices. 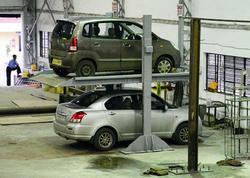 We are one of the prominent names in this domain, known for offering our clients an extensive range of Parking System. This Mechanical Car Parking System is used widely in residential and office complexes and in other such places that are frequented by a lot of people. Our complete products undergo various tests to ensure its durability and working capacity. 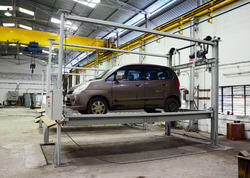 We are the manufacturer and supplier of two post car parking lift to our clients. We are ranked amongst the best in business, indulged in offering a superior quality range of Stacked Parking Systems to our valuable clients. These Stacked Parking Systems are useful in providing additional parking space in the already available parking space in existing or new building where height is not a constraint. Additionally, these products are tested by our qualified and experienced professionals. Multi level Puzzle car parking system is most ideal for public places like Malls, Hotels, Hospitals, commercial buildings, shopping complexes etc. It will be of much use for residential complexes as well. You may visit our website and see the video which gives details of the system. 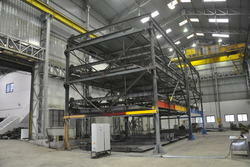 System can be offered with 5 to 6 floors and 6 to 7 modules. 5 to 50 vehicles can be parked. Fully automatic and independent parking system. Parking and retrieval is very easy. Controlled through PLC. Please send your enquirers. This is a G+3, 6 modules Puzzle parking system. Multi level Puzzle car parking system is most ideal for public places like Malls, Hotels, Hospitals, commercial buildings, shopping complexes etc. It will be of much use for residential complexes as well. You may visit our website and see the video which gives details of the system. System can be offered with 5 to 6 floors and 6 to 7 modules. 5 to 50 vehicles can be parked. Fully automatic and independent parking system. Parking and retrieval is very easy. Controlled through PLC. Please send your enquiries.